This Oakville wine cellars renovation completed last month by Toronto Custom Concepts showcases a more contemporary design to highlight a smaller collection of wines in a home. 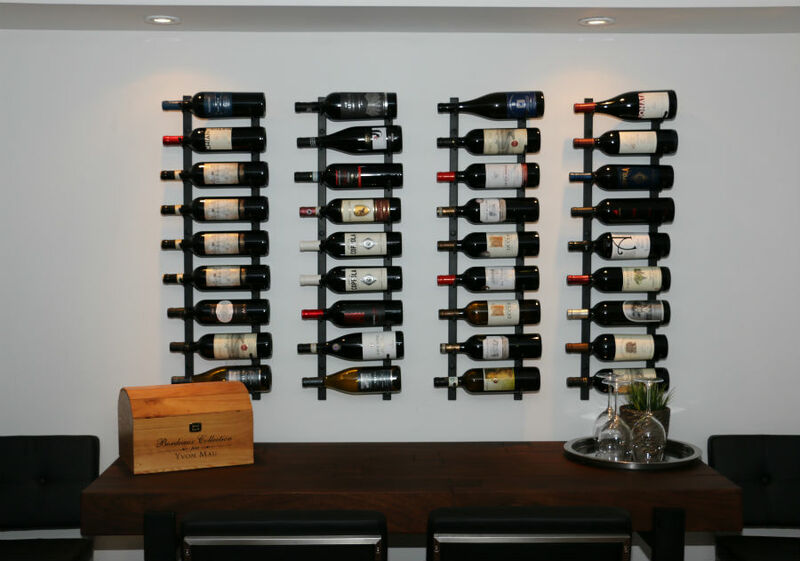 The wine cellar display leverages the amazing wall wine racks from VintageView. These wine racks have a sleek design to them to allow people's attention to be drawn to the wine bottles on display rather that to the racking hardware. These steel wine racks are well designed and very sturdy when installed correctly. The VintageView racks come in a variety of finishes. We used the Black Satin finish on this project, but they also come in a Platinum (brushed Nickel), Black Chrome, and Chrome finish to suit your design and colour patterns. The wine rack can be stacked vertically and they come in a variety of sizes including 12 inch (3 bottles), 24 inch (6 bottles), 36 inch (9 bottles), 48 inch (12 bottles). The rack also come in 3 different bottle depths (single, double or triple bottles deep). Easily one of the best racks to add to your next wine cellar renovation.